I pondered ringing the club, the weather was looking bleak again. I’d waited until the last minute for the phone to ring or the weather to clear, time to make a decision: We’ll go for it…..
Light rain was coming down, but the weather was made to feel worse then it was by the bitter cold wind. It felt almost embarrassing to be turning up in this weather, I’d take one step through the door and find instructors holding hot drinks, reading news papers and wondering how to fill their day. I left my flight bag in the car, won’t be needing that – or so I thought. My first words to the admin girl were “I know it’s going to get cancelled, but I figured I’d just come anyway and book some lessons.” She’s clearly wiser then me though, replying she didn’t think it was. Really? I give up on this weather lark. The instructor raised similar questions of why did I think it would be cancelled….. The wind, the rain, you can’t see a patch of blue anywhere. But the weather system at the club said the wind was actually only around 8 knots, gusting to 10-12. Doable. The cloud base was up at 2000-2200, bit on the limits just about doable and the rain……actually it was starting to stop quite nicely, the odd drop here and there but getting better. We’d wait for some feedback from an instructor currently in the air, but I guess I’ll put my hi-viz jacket on and go and find the plane then. Temperatures had dropped to freezing overnight, so the plane (Whiskey Kilo) had been moved into a hanger. This made checking the plane a much more civilised affair – the hanger being heated to ~18C. It still strikes me as a little strange to just be walking around a plane in a hanger with only a handful of people who know why I’m there, any minute someone is going to come and ask me what on earth I’m doing. But nobody does. Whiskey Kilo still has a broken starboard strobe, but other than that, in top shape with plenty of fuel. Now just a matter of waiting for the plane to be brought out of the hanger, but a fire alarm meant this would be delayed – every minute wondering if the weather was going to get better or worse? Time for a coffee, as I was with an instructor I’d previously got some cake from on a cancelled lesson, the joking request was “….just missing the cake.” The gods were looking down kindly on me today, as my instructor disappeared and returned with a cup cake, the last in the box 🙂 I believe home made and excellent. Coffee and cake while waiting for your plane, life is good. The fire alarm meant there was no sign of our plane moving, another GA pilot hanging round the club suggested we move the plane ourselves. Swinging open the massive hanger doors, it was then a case of musical aeroplanes as Charlie Bravo had to be shifted out of the way first. Now we had Whiskey Kilo out, but what to do with Charlie Bravo? As I had my headset in the plane I got the job of turning it on, radioing the tower and getting a taxi clearance to shift it to parking. Seat belt nearly scuppers it all. Cambridge Tower, Golf Sierra Hotel Whiskey Kilo with Information Juliet……..Requests Taxi. The take off was alright, I can’t say I payed special attention to it but it seemed straight enough, sat at a nice 80 knots and all very civilized – until my instructor noticed the heading direction indicator (HDI) wasn’t aligned to the compass, ahhh but I have an excuse, she blitzed the pre-checks this wasn’t one of my checks today 🙂 Easily corrected once straight and level. Easy until I overshot 2,000 and went to 2,300ft. Where the horizon stopped and a mist of clouds began, we’ll go back down then shall we…. We listened as another student did his, doing a disgracefully good job of it too, great thanks for that. But then events transpired that we had a window to press on and get at least one practiced forced landing in before returning to this. The book says aim to fly it almost like a proper circuit, with hindsight from 2,000ft two things went wrong next. Firstly at 2,000ft fields look actually quite small – I can make it, but could I land in it & stop? This combined with wanting one I could fly a circuit to, meant I basically picked one to far out. 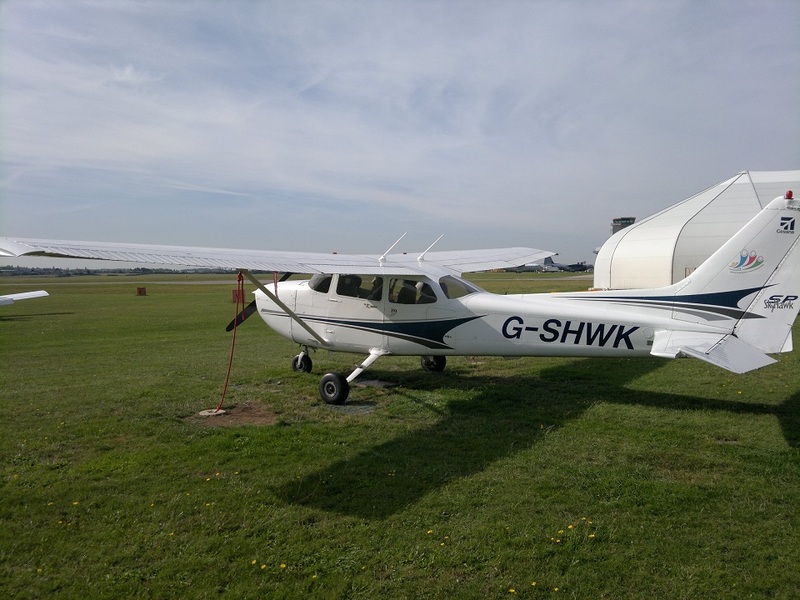 The airspeed was a pretty decent 70 knots all the way, but after 1,000ft of descent, the wise voice in my head (that would be my flight instructor on the intercom) suggested perhaps we wouldn’t make that and how about another one a bit nearer. All in all we had the advantage of largely being surrounded by fields, but this was rough to say the least. Still I’ll take a positive from it, I still find it bizarrely calm to close the throttle and drop to 500ft. The mistakes on the second go were much the same, first the fields all seemed too small, which pushed the field selection further out, to one that put us at 2,000ft and essentially in the downwind approach. Two stages of circuit to fly, 1,500ft to drop, seemed almost ok. My naive self still ponders if I’d have made it to this field, but with some (no doubt much wiser) words suggesting we might not . How about picking another? Having dropped some altitude and the fields starting to look a little bigger, now the field directly in front of us was looking pretty good. From there on in this attempt went much better, ultimately concluding in a decision we’d have landed in that field. All said and done, it might have only been a one off practice, but actually hearing someone come back and the response you’re going to get etc. I found really useful. Much happier with what the size/shape would look like from 2,000ft (and what they’d actually become when down at 500ft), it was easier to keep the field selection to roughly within the 10 degree angle that the plane should be able to glide to. This attempt still had multiple re-selections though, what looked open at 2,000ft had a big power line or pylon thing 1/3 into it at 1,000ft. Thankfully the original field wasn’t selected as the only show in town, but its surroundings, were good too – so the field selection could be quickly switched to the field to its right as required. Other than that, by now I found I was quite comfortable with how big a field was actually going to be when I got down to 500ft and being sure about the size, played greatly in my head with respect to how far I’d try and push the selection window outwards. The green/yellow one, next to the slightly darker green one, just after the brown one, just right of the green one with a hedge. Time to head for home, other than my entry into the circuit, dropping straight through 1,000ft to 800ft, oops. It was a crosswind join that went alright. 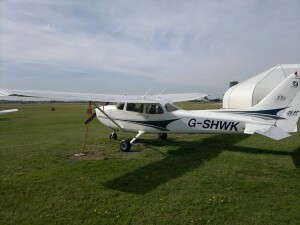 Another nice landing to cap off the lesson and all in all, fairly decent and I enjoyed it. I think a couple of those glides could have been better, especially the first two but what I really took from this lesson was a good feel for perspective of what the fields & surroundings would look like from 2,000ft and that a certain size/shape at that height, would turn out to be all good once down at 500ft. In the debriefing my instructor was looking through the checklist, and announced that next up was potentially a Local Area Solo, subject to getting good weather next lesson. 90% of me is very excited, the other 10% is thinking they must be joking! This entry was posted on Thursday, December 20th, 2012 at 10:27 am by PHC	and is filed under Actual Lessons, PPL Course. You can follow any responses to this entry through the RSS 2.0 feed. You can leave a response, or trackback from your own site.